I went to fitness camp, as I have (almost) every August since 1987. My husband and I attended our 22nd camp, continuing to thoroughly enjoy the week of pure fun and total physical exhilaration. Camp feeds me on many levels. The cooler weather of the higher elevation; the beauty of both flatland and mountainous desert geology; long summer days chock full of running, cycling, swimming, hiking, yoga, dancing, sun rises, sun sets, star gazing and, of course, eating, all touch my soul. And my camp buddies are there every foot strike and pedal stroke joking, laughing, and living fully in each moment, completely leaving “home life” back home. I open myself to as many experiences as I possibly can while at camp; returning home physically spent, but deeply satisfied. Being a very kinesthetic person, I know physicality is a primary portal for me to experience my deepest sense of aliveness. exhilaration of physical exercise and I love them both. Do you know your portal to aliveness? How often do you play there? Want to play more often? 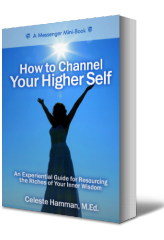 Join me for “What’s on YOUR Channel?” In this interactive and fun 6-week telecourse I share a number of exercises to expand your skill set for recognizing and integrating portals to your Higher Self.